The closest most comfortable shave in the world. • Sensorn Excel has a series of soft, flexible microfins positioned in front of the blades to protect your skin while gently setting up your beard so the blades can shave closer with incredible comfort. • And SensorExcel has self adjusting twin blades that automatically adjust to every curve of your face and safely respond to every detail of your skin. 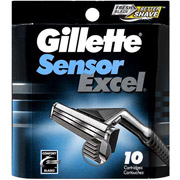 • No razor feels more comfortable during your shave or leaves your face feeling smoother after shaving than SensorExcel.